GAME NEWS: DICE Unveil Epic MultiPlayer Carnage in New 'BATTLEFIELD 3' Trailer @GamesCom! 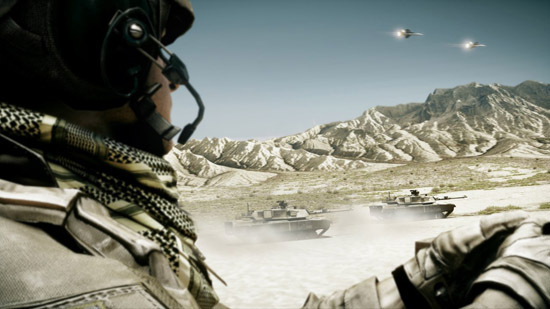 Battlefield 3 is proving to be one of the most anticipated games of 2011, having already won over 50 awards including ‘Best Action Game’ & ‘Best Online Multiplayer Game. In this teaser released today at GamesCom 2011 DICE display massive multiplayer carnage in intense 64-player vehicle warfare including jets, from Battlefield 3's multiplayer map 'Caspian Border'. Battlefield 3 will be available this Oct 25th for the PlayStation 3, the Xbox 360 and the PC. Hit the jump for the details. I'm reading: GAME NEWS: DICE Unveil Epic MultiPlayer Carnage in New 'BATTLEFIELD 3' Trailer @GamesCom!Tweet this!